Rental Car - Homebrew - SMS Power! This is "Rental Car", Aypok and PlayGeneration's entry in to SMS Power! 's 2011 coding competition. Aypok is useless at time-keeping, so this release is unfortunately far from what was intended to be submitted, but 'tis better to submit something vaguely working than nothing at all. The two creators can be contacted through the SMS Power! forum (as well as the Sega8bit forum) using the aforementioned user names. There's no sound, but the game does run fine on real hardware. In its current form, there is no real goal - you just drive from the start to the end. There is supposed to be a goal, but Aypok hasn't had a chance to implement it (like about 75% of the content...). Anyway: on with what is in there. You have rented a car (hence the name of the game) and it needs to be returned very soon. You start parked outside of your house and you need to drive to the rental shop, avoiding any hazards that may be in your way. From a standing start, pressing "up" will put your car in to first gear and you will set off. After nearly a second, you can press "up" again to change in to second gear. Just over one second later, pushing "up" again will change your car in to its top gear (3). Furthermore, you need to release the "up" button between changing gears. Pressing "up" at any point will also move your car up and down the screen, as well as changing up a gear. Pressing the "down" button will – if in motion – change down a gear. Unlike when changing up gears, there is no delay between changing down (although you do need to release the button and press it again to drop more than one gear - holding it will have no effect). Pressing "down" at any point will also move your car down the screen. You cannot steer when reversing. You cannot stop by simply pressing "down" - that will only put you in to the lowest gear. To completely stop, press "down" whilst holding button "2" (you need to be in first gear). Certain objects (such as: buildings, trains, other vehicles) are solid and will stop your car when driven in to. 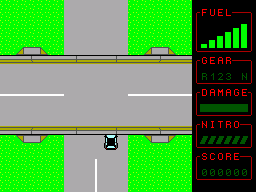 Some other objects (such as: fields, water) are very rough, so your car cannot travel over them at a very high speed. Too many to list, but I'll cover the major ones. Most of them are simply to fix, but are left in due to time constraints. 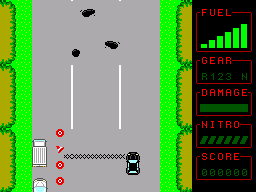 Background colour of the car is grey (noticeable when driving off-road). White lines on bridges are transparent. 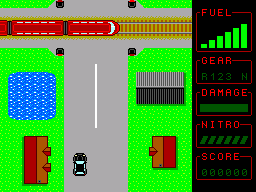 Trains can drive through the player (player-to-train collision-detection is done, but the other way is not). Pressing "pause" resets the game. That's actually a "feature" to help with development. After hitting something (or being slowed), it may stop you from accelerating. You can reverse over solid objects. So much stuff... There are pages of neat ideas to be added - eventually. Sadly, they're all omitted from this release. They will hopefully be present in a future release. Damage, scoring and all that HUD-updating stuff. Better and longer levels (and more levels). 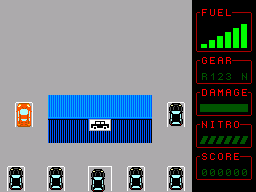 More vehicles (and more colours). Already drawn and ready for inclusion. Level-editor (building this by hand was a pain in the rear...). Tiles need a bit of optimising. Created by and copyright to Aypok and PlayGeneration (2011). Distribution: This archive and its contents may only be distributed by SMS Power! (and its mirrors). Unless otherwise specified by the copyright holders, this may not be distributed by any other means/mediums, on any other sites/servers/formats or by anyone else in any way, shape or form. You are welcome to put this on an SMS cartridge (via [E]EPROM or flash card, etc) in order to play it on real hardware, but you may not distribute it in that way. Unlike all previous software releases, this release does not include the source code (or anything other than this readme and the binary SMS ROM). The reason for that is solely due to it being so very far from completion. Once this is much further along in the process, the source code (along with all data files needed to build it from scratch) will be publically released.